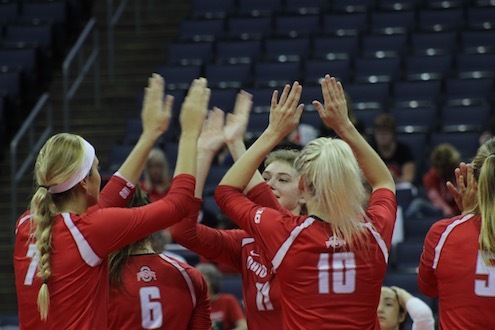 The Ohio State women’s volleyball team (8-4, 1-0 Big Ten) swept the Maryland Terrapins, 3-0, securing its first Big Ten victory this season on Wednesday. The Buckeyes won 25-20, 25-16 and 25-16, respectively. With a total of 44 kills, five blocks and a .364 hitting percentage, the Buckeyes played well enough to ensure the Terrapins would not take away the home win from them. Ohio State head coach Geoff Carlston was proud of how his team played and how they used their strengths to start off strong in the conference. The Buckeyes and the Terrapins were both determined to take the first set as they started off the game with nine lead changes and 12 tied scores. Although Maryland delivered four solid blocks, it was not enough to top the Buckeyes’ 16 kills, 11 assists and 11 digs in the first set en route to Ohio State’s 25-20 victory. The Buckeyes did not slow down in the second set as they started with a 5-1 score. The Terrapins upped their game with six blocks from their defensive line, but the Buckeyes fought back with 28 kills, nine of them coming from outside hitter Luisa Schirmer. Ohio State played no different in the third set as the team quickly racked up points. With a 16-10 lead, the Buckeyes called a timeout and seemed to gain more momentum coming out of the break. Maryland’s 19 errors further helped the Buckeyes win the match, claiming their first Big Ten win. Outside hitter Ashley Wenz contributed 10 kills total to the match. Despite playing well, Wenz praised setter Taylor Hughes for how she played the game. Carlston has seen improvement in the team since the start of the season, but believes there is always a way to get better. 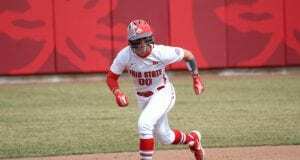 The Buckeyes will be heading to West Lafayette, Indiana, on Saturday to play No. 13 Purdue for their second conference match of the season. 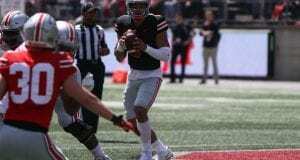 Wenz said the past few wins has helped build the confidence the Buckeyes need to go up against Purdue this weekend. “Being able to provide our own energy will be the biggest part of it for us,” Wenz said. Carlston has faith that his team will play well on Saturday after its performance against Maryland. “Every match is going to be a battle, but I think this team will be good on the road, so I’m excited to get out there and play,” Carlston said.